CINCINNATI - The Division III basketball game between Mount St. Joseph's and Hiriam College on Sunday was far from ordinary, and it wasn't just because of the packed arena and the basketball luminary in attendance and the NCAA's decision to move the game forward ahead of schedule. 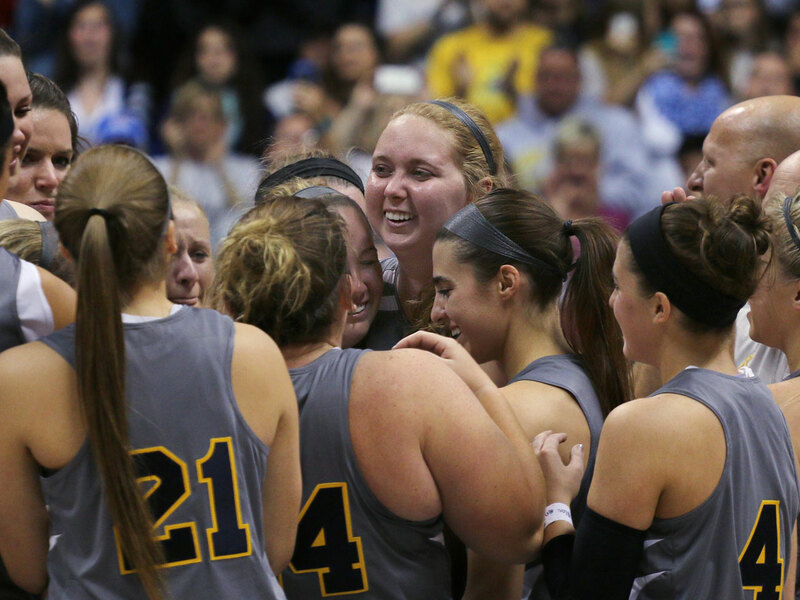 The game was special because of one freshman forward, number 22, Lauren Hill, who made her college basketball debut while battling an inoperable brain tumor that has given her just months left to live. Hill had long dreamed of playing college basketball, of fulfilling a hope she had had since middle school. She needed just 17 seconds to make her dream come true, albeit differently than she initially imagined. The freshman forward made an uncontested left-handed layup for the opening basket after her team one the tip. Her tumor that has forced the right-hander to shoot with her left hand because it has affected her coordination. Her shot brought a standing ovation from a sellout crowd at Xavier University's 10,000-seat arena and was among many emotional moments for Hill, who received love and support from the moment she walked out for warmups. Her audience included former Tennessee women's coach Pat Summitt. Her coach said normally 50 people attend their games. Hill has a brain tumor the size of a lemon, and it is growing daily. She was diagnosed last fall after suffering from vertigo and dizziness while playing for her high school team, reports CBS News correspondent Vladimir Duthiers. Despite her condition, she committed this year to playing basketball, a game she first fell in love with in the 6th grade. "She's chasing a dream," her father, Brent Hill, told CBS News' Steve Hartman. "And she wants people to see that - that they can do that." Her parents said she actually asked the doctor: "Can I at least still play basketball?" Her attitude is remarkable -- the only tears a CBS News crew ever saw when interviewing her were of joy when she read about all the people who were supporting her charity called the "The Cure Starts Now." Curing pediatric brain cancer is one of her two top priorities. The other is simply to live long enough to play in her first college game. "I wanted to wear that jersey and feel like a superhero again because that's what I feel when I put on the jersey and that number," said Lauren. Everyone where she lives, near Cincinnati, Ohio, knows her jersey number -- 22. Everyone at Mount Saint Joseph University, where she's a freshman, knows of her remarkable commitment to this team. Believe it or not, even though Hill now has just weeks to live, she still gets up at 5:30 a.m. for basketball practice. Even though she can't even do most of the drills anymore, she still tries. She said she's not scared dying. "But the people I worry about are the people that I'm leaving behind," Hill said.